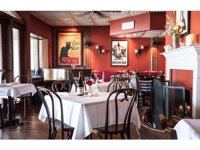 Defined primarily by the food served, the name bistro suggests cuisine that alights somewhere between home-style and haute: soul-warming bourguignon and cassoulet, onion soup, muscles, and cheeses, confits, salads, and croque-monsieur, frites, and haricots vert. 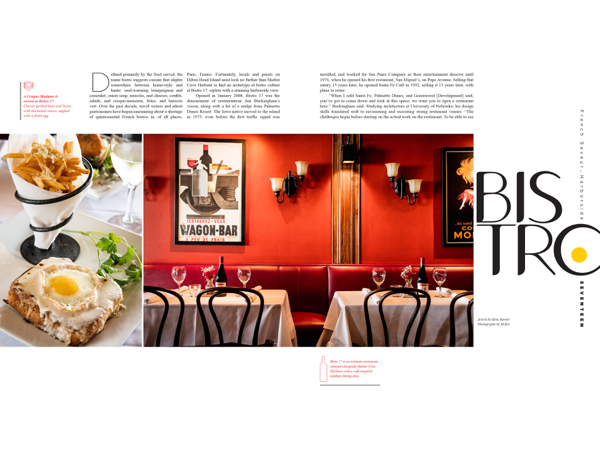 Over the past decade, travel writers and adroit gastronomes have begun murmuring about a shortage of quintessential French bistros in, of all places, Paris, France. 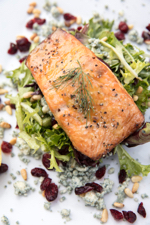 Fortunately, locals and guests on Hilton Head Island need look no further than Shelter Cove Harbour to find an archetype of bistro culture at Bistro 17, replete with a stunning harborside view. Opened in January 2008, Bistro 17 was the denouement of restauranteur Jim Buckingham’s vision, along with a bit of a nudge from Palmetto Dunes Resort. The Iowa native moved to the island in 1973, even before the first traffic signal was installed, and worked for Sea Pines Company as their entertainment director until 1976, when he opened his first restaurant, San Miguel’s, on Pope Avenue. Selling that eatery 15 years later, he opened Santa Fe Café in 1992, selling it 13 years later, with plans to retire. “When I sold Santa Fe, Palmetto Dunes, and Greenwood [Development] said, you’ve got to come down and look at this space; we want you to open a restaurant here.” Buckingham said. Studying architecture at University of Nebraska, his design skills translated well to envisioning and executing strong restaurant venues. “The challenges begin before starting on the actual work on the restaurant. To be able to see what it’s going to look like before it actually takes place; that’s a gift. It turns out that I am able to do that. Buckingham is grateful for his experienced chefs and servers. “I’ve had the same chef for seven years, and a full staff of about 15. I am so blessed with having a great staff,” he said. Several team members have a deep knowledge about the restaurant’s superb wine selection; answering questions and making recommendations table-side is a measure of the alchemy of Bistro 17 dining. Bistro 17 is in the exact right spot to enjoy all the benefits and activities celebrated at Shelter Cove Harbour. “We have concerts in the spring, fireworks during the summertime, and more concerts in the fall,” Buckingham said. Participating in the harbor-community’s events is a big part of their calendar, including the tastings that go along with the music and dancing every Thursday throughout the spring and fall. They also support local charitable causes, focusing their efforts primarily on the Hilton Head Humane Association and the Hilton Head Symphony Orchestra. Originally focused on serving good food to the tenants in their immediate neighborhoods, Bistro 17 is much like its Parisian counterparts. “We cater to the locals,” Buckingham said. “Tourists ask the locals where to go. We’ve really grown primarily by word of mouth, and that’s worked out well so far.” Bon appétit. 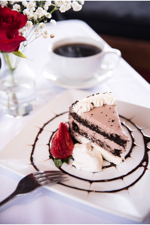 Located at 17 D Harbourside Lane, Hilton Head Island, Bistro 17 gladly accepts reservations. For more information, or to make a reservation, please call (843) 785-5517.